Pretty don’t you think? Inking is either an artist’s habit or one’s waterloo, but it is an essential skill to be learned in comic art. Knowing how and where to put your lines can make or break your art. An amazing pencil art could easily be brought to life by inks — or on the other hand unskilled inking can ruin even the best pencils or make a bad pencil art look amazing. So it is essential to learn this skill — and some people even specialize in INKING. Each artist have their own style of Inking and depending on that style, people grow to love or hate their art. But before I go further and further from the point (which I probably already have)… In this series, would like to introduce people to the ART OF INKING with the basic techniques, how to do them and what to do and what not to do. 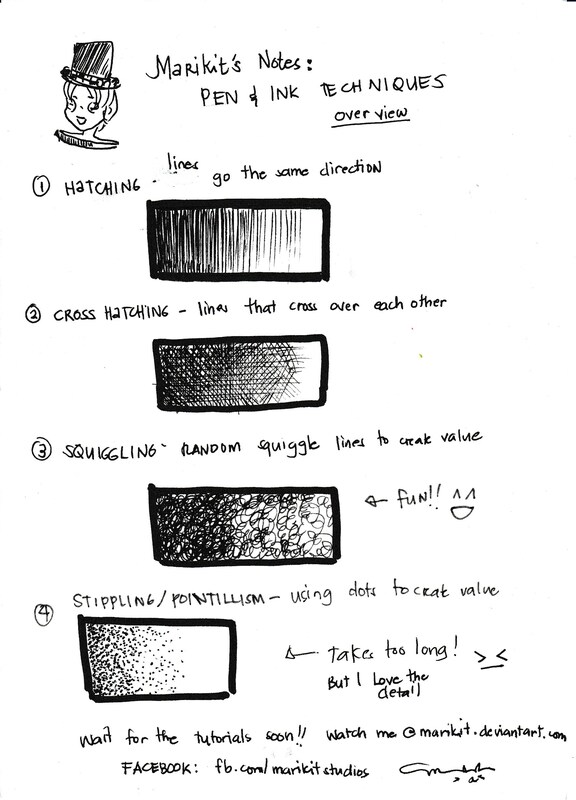 Over the course of 5 (or so) blog entries – I hope to take people through inking basics in the hopes to help them — or improve their skills as well as review my own skills. I will try to upload videos, put notes on inking techniques as I go along. Bear in mind, I am only a hobbyist and also a student of the craft. What I teach is also based on my experience as a self taught artist. So, I can only give practical advice and leave the other things to the pros. As an overview of the skills we will be discussing here are some of the techniques I have learned…. BTW, if you are curious about what INKING MATERIALS are needed and that I use check out this VIDEOBLOG I posted before. Watch marikit studios for updates on this series. Been a while since I last did this.